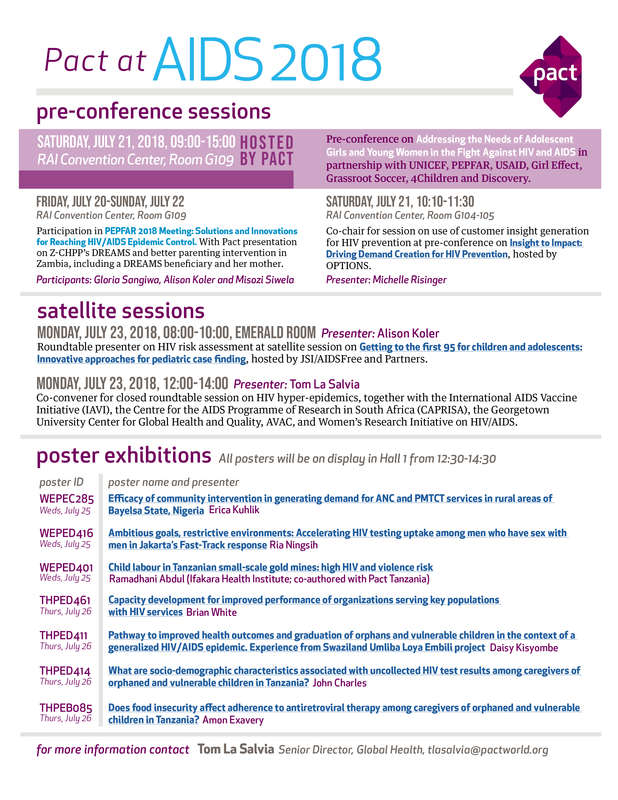 On Saturday, July 21, in Amsterdam, Netherlands, Pact will bring together more than 50 experts in reaching one of the most vulnerable populations to HIV, adolescent girls and young women. Every day, nearly 1,000 young women become infected with HIV. Due to a host of interpersonal and social factors, they are among the most vulnerable populations to contracting HIV and other sexually transmitted diseases. The workshop will explore avenues for addressing the needs of these young women and take a focused look at key populations within the broader population. Speakers include representatives of UNICEF, USAID, GirlEffect, 4Children, Grassroots Soccer, Discovery and Pact, as well as two adolescent girls from Zambia and South Africa. In addition to the pre-conference, Pact staff from around the world will join other leaders from the scientific, advocacy and human rights communities to present key results and lessons from our work to stop the spread of HIV and improve the lives of people affected by the disease. What are socio-demographic characteristics associated with uncollected HIV test results among caregivers of orphaned and vulnerable children in Tanzania? Does food insecurity affect adherence to antiretroviral therapy among caregivers of orphaned and vulnerable children in Tanzania? These presentations highlight Pact’s commitment to the global mandate to end the AIDS epidemic by 2030 and to the Fast Track goals to reach 90-90-90 by 2020. To learn more about the International AIDS Conference, visit the conference website. Follow us on Twitter and Facebook for highlights from the conference!